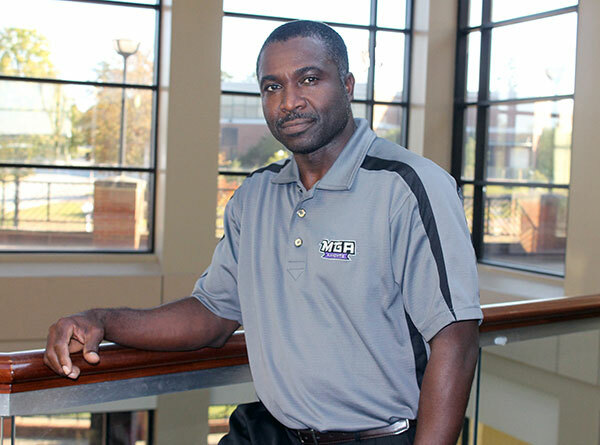 When events run smoothly at MGA, Fabian "Flash" Gordon is among those the University community can thank. He is also a student at Middle Georgia State, working on a Business degree. Full Title: Event Coordinator and Custodial Manager. Degree: Bachelor of Science in Business Administration (in progress) from Middle Georgia State. Describe your service to Middle Georgia State University. "My accomplishment here at Middle Georgia State University is my commitment to outstanding customer service to the entire MGA community. I think just knowing that each event, class, or workplace has been properly set up, cleaned and ready to go is a great accomplishment for myself and the rest of the team. My job as an event coordinator and custodial manager depends on the support of my team members. This helps ensure that instructions and tasks get communicated and completed all the way down to the least detail. I always allow myself the flexibility to be adaptable and flexible to the needs and concerns of MGA. "Being on the job now for little over a year, I am happy to call this an accomplishment even though it’s ongoing with new challenges daily. Our students, staff, and faculty deserve the best, and it’s my top priority to be fully aware of the new challenges. This allows us, as a team, to be ready for what each day brings. We are constantly in communication with our customers to ensure that challenges are being overcome and all actions are taken to successfully complete each request. I believe that this is one sure way to build a strong and striving MGA community." What attracted you to a staff position at Middle Georgia State University? "The opportunity to be active and involved in the planning details on the preparation side of events. Then it gives me great pleasure to see the execution of the events." What do you like best about working at Middle Georgia State? "The satisfaction I get from making sure students have a clean and safe environment in which they are comfortable and relaxed. Their focus should be the classroom and not the fact that their surroundings are not up to par." In your opinion, what does it take for students to be successful these days? "It truly depends on them playing a major role in their education and being active participants in learning by searching out additional information and resources." "I do not like being in the spotlight and always do my best at all times no matter who gets credited for each completed task."